Over the past forty years, a silent invader has been gaining ground in Chateaugay Lake. Eurasian water milfoil, an aggressive non-native aquatic plant, has been spreading throughout the lake system. Aided by boat traffic, which carries the plant from place to place on propellers and intakes, it is now taking over large areas of the shoreline waters. The map above shows the accelerating spread of Eurasian milfoil in recent years. In 2002 (yellow), Eurasian milfoil was already well established in the Narrows and Outlet of the Lower Lake. There were scattered beds along the shoreline of the Upper and Lower Lakes. By 2005 (red), volunteers surveying the Upper Lake and the Narrows south of the Bridge found dramatic increases in milfoil coverage. On the Lower Lake, only the Outlet and the area off the former Lakeside Restaurant were surveyed, but expansion was also evident. 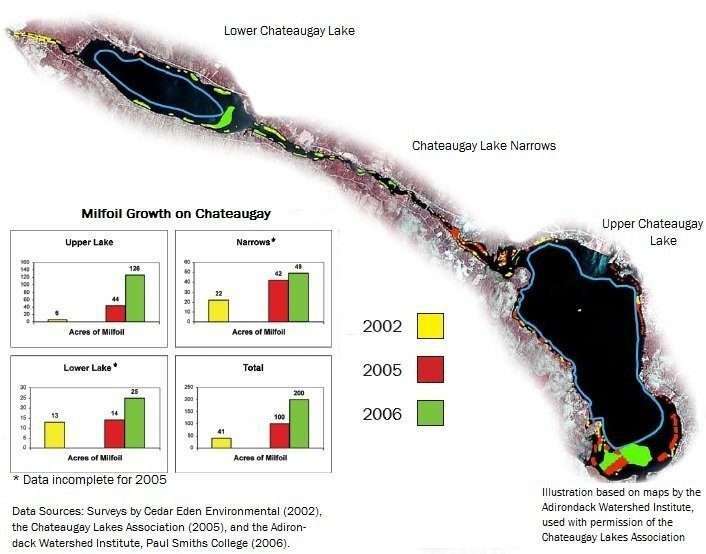 In 2006 (green), a more comprehensive check of the Lower Lake found a large, previously undetected bed of milfoil spreading out into the middle at the inlet from the Narrows. The Narrows was continuing to fill in and the size of the milfoil bed in the South Inlet had doubled from the previous year. The total acreage of Eurasian milfoil in the Chateaugay Lakes had increased from 41 acres in 2002 to 200 acres in 2006! The littoral zone where light reaches the bottom and plants can grow extends to depths of about 15 feet in Chateaugay Lake. This zone, which includes all of the Narrows, is marked on the map by the solid blue line. Eurasian milfoil could eventually fill in this shoreline zone, much as we already see happening in the Narrows. Once Eurasian milfoil has become established in a water body, it is unlikely to be completely eradicated. The goal is to bring the infestation under control by reducing it to a low level that can be maintained on a routine basis. Many treatment methods are problematic. Harvesting with mechanical cutters can make things worse by promoting lush growth and creating fragments that become new plants. Herbicides are rarely approved for use in the Adirondack Park and are ill suited to large open water bodies where it is difficult to contain applications to a specific area. Biological controls, such as weevils that feed on the milfoil, are still experimental and—at $1 per insect—can be quite costly. A winter draw-down of sufficient magnitude to dry or freeze plants would raise environmental concerns, not to mention insurmountable permitting obstacles in our case. In 2006, consultants from the Adirondack Watershed Institute at Paul Smith’s College mapped the milfoil beds in Chateaugay Lake and recommended hand-harvesting and removal of the milfoil by scuba divers, combined with installing underwater (“benthic”) mats. The mats are used to smother dense growth in areas where hand-harvesting is not safe because of boat traffic. This approach was deemed the most feasible and environmentally sound for Chateaugay Lake. The highest priorities for control are heavily infested sites that are sources for spreading the milfoil due to wind and water currents or heavy boat traffic. These include the Boat Launch, the Sand Bar, the inlet to the Upper Lake (South Inlet), and the inlet to the Lower Lake. Control efforts began in 2008 at the Boat Launch site and have continued since then. Each year, milfoil density is measured at the treatment sites at the beginning and end of the summer. Milfoil density has been significantly reduced in the areas targeted for treatment (see Project Results). The best results have been achieved by hand-harvesting, so use of benthic mats is being discontinued Today’s biggest challenge is raising funds to maintain and expand the area brought under control.